Terri, it's so good to have you back! Martha has been such a great hostess and kept us informed and praying for you and your son. 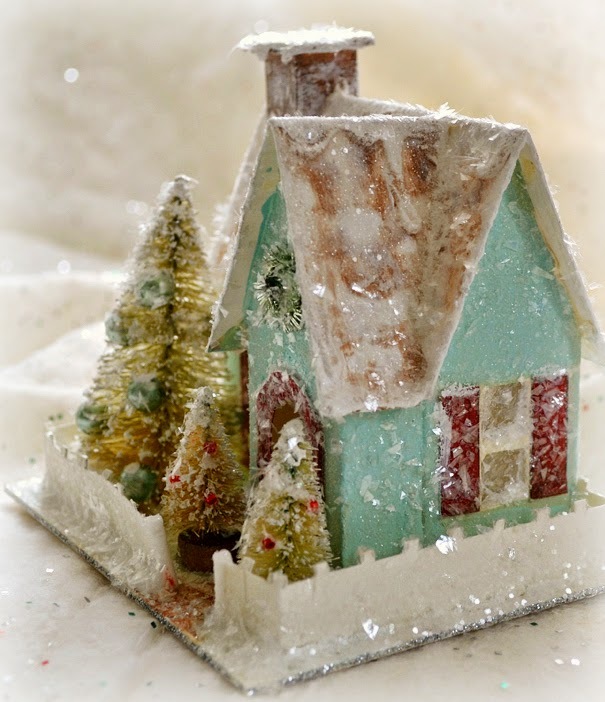 Your thistle teacup is a beauty and your darling glitter cottage is just adorable! Oh, how I'd love to make on of those. It is too cute for words. Hugs sent your way and blessings, too. I haven't finished my Tea-Time Tuesday post but was so excited to see you're back I just wanted to check in and say "hi !" I love the little glitter house especially, but even more that you're back. Welcome back sweet lady with your party and such a beautiful post with your lovely RA teacup. Thank you for having us back at Tea Cup Tuesday again. oh I was so happy to see a part of yours on my blog, I clicked on your name. .. and Yesssss Terri is back with a nice cup of tea and a gorgeous little cottage! Welcome back in Bloglandia! I wish you a beautiful Christmas season! I'm very pleased to read you again! Hope you're fine! I love too this teacup, it's marvellous! Pretty teacup and I love the little house so festive! That little house you made is absolutely GORGEOUS!!!!!! Yay, hooray, welcome back kindred, I have missed you and your creative world very much and all of the inspiration you share!Love that sweet house, the color is magical! 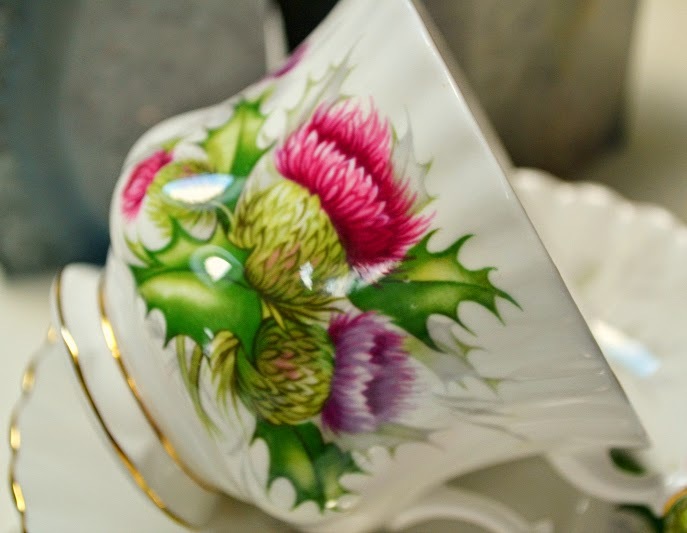 I also am smitten with the thistle cup, I love thistles, so pretty, beautiful pictures! So lovely to see a post from you. All so lovely and warming... that house is the sweetest. It's so nice to see you. Martha has been the hostess with the "mostest", but you have been missed. Love your thistle teacup, but have to say your Christmas house takes the cake today! Happy Happy and a Merry Ho Ho HO to you! Welcome back sweet Terri! We have all missed you and your gentle spirit. I adore your little charmer in robin egg blue, one of my all-time favourite colours! She's looking so cozy. 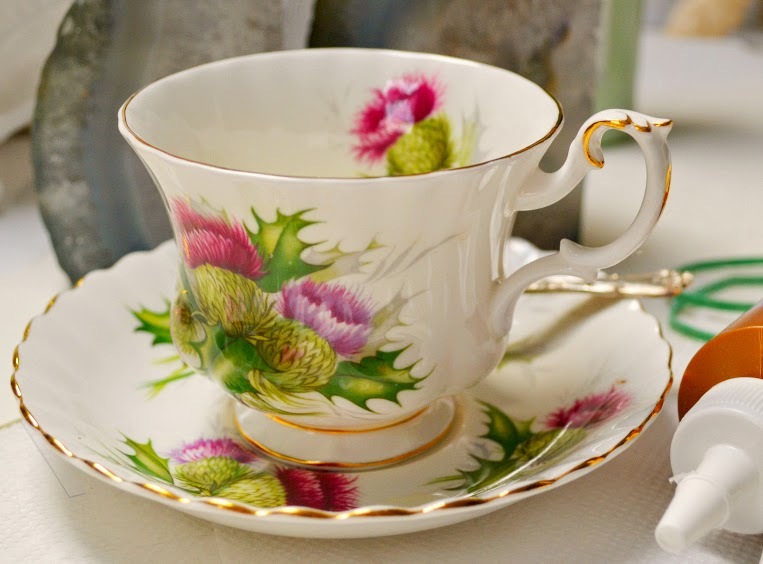 Your thistle teacup is gorgeous. RA always makes such pretty teacups. Thank you for sharing and take care, my friend. So glad to see you back again Terri! Your teacup is very elegant and delicate looking. And your cottage-SO very charming!!! Growing up my parents used to put up a large putz/ Christmas village complete with a running train and buildings that had to be put together such as this one. Thanks for taking me back to it! So nice to see you blogging again Terri. I love your cottage, just beautiful! Thanks for Tea Cup Tuesday. Oh dear Terri, here you are, how wonderful, my friend. And then with such a most beautiful post, with that gorgeous little house. It looks wonderful, must have been a big work, to both draw, cut and put it together, not to speak of painting and glittering, which you did to my hearts content. It is stunning dear terri. And your lovely cup, is surely a beautiful choice to drink your afternoon tea,from!! I`m so happy you are back here, my friend, and welcome you with a hug. Welcome back Terri! Your cottage is so beautiful and fun! And I love the thistle teacup. I have two, they remind me of our Scottish heritage. How wonderful to hear from you....welcome back! You've been missed! Your cottage is so cute! I have a few putz cottages from my childhood. Love the pretty teacup as well. So glad you are better! 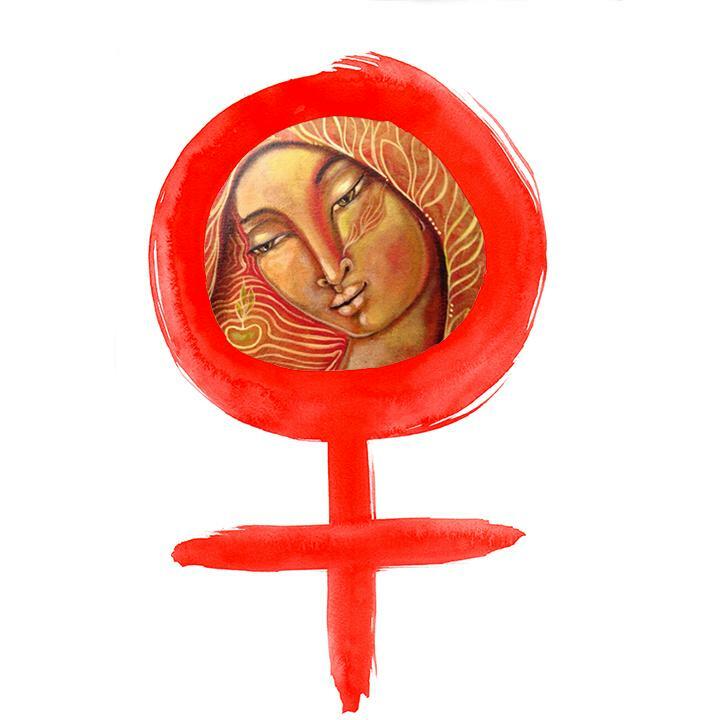 Come and link to Tuesday Cuppa Tea! Je suis ravie de vous retrouver sur le Net. Voir de très belles tasses à thé tous les mardis me manquait beaucoup. Cette tasse est vraiment ravissante et la petite maison sous la neige toute mignonne. I love your little house. It's full of Christmas spirit. The colors are marvelous. I also love your cup. The design is so perfect on that crisp white background. Welcome back! Hi Terri! So glad to see you back!! Your little house is fab! I love that teacup too. I have one just like it and I love it! Hope you are having a lovely time here before Christmas! Cute little tea house! I always love teacups which have design on inside as well! Welcome back dear Terri! You have been missed. So wonderful to be able to share a cup of tea with you again, i have missed our weekly tea drinking ceremony. 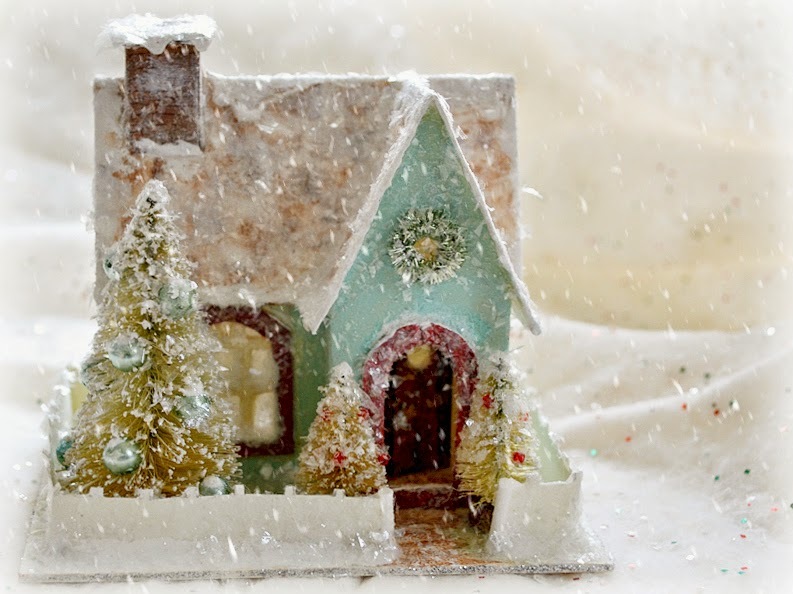 Woukd love to enter your sparkling fairy tale residence. Such a dainty and gorgeous beauty. Love having you back. Welcome back! Just wanted to comment on your sweet little house. Reminds me of one that my grandmother had when I was little. You are one of the first blogs I had ever visited back in 2010, me thinks? So, I have been following you a long time, especially when your fairy house tutorial caught my eye. Lovely to have you back to the land of blogging. 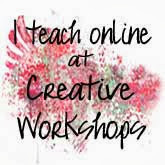 I have managed to make at least two posts a month this year on my blog which is not a lot, but it has kept me connected with kindred spirits. 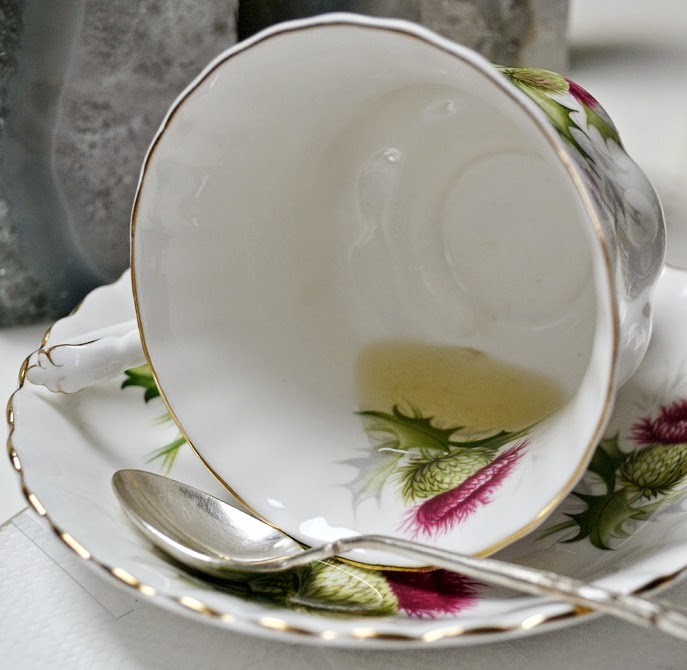 The tea cup is so very charming. Royal Albert has made some of the most beautiful tea cups. Thank you for the reminder about chamomile tea and also ginger tea. I have a hard time drinking the black tea as the caffeine affects me worse than coffee does. Have a very lovely Holiday Season! 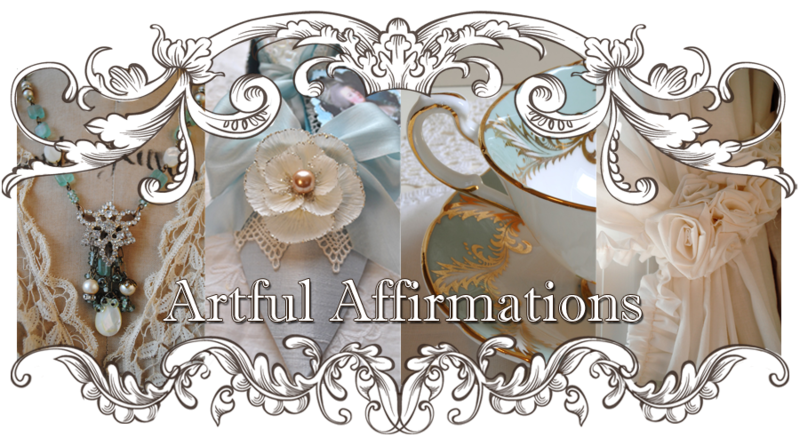 A very pleasnt surprise indeed to see Artful Affirmations active in blogland once again. 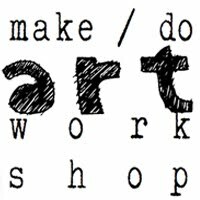 So nice to hear you have been creating while away. A lovely and inviting welcome back post. Oh it is so so so so nice to see you are back! You have been sorely missed, my sweet lady! 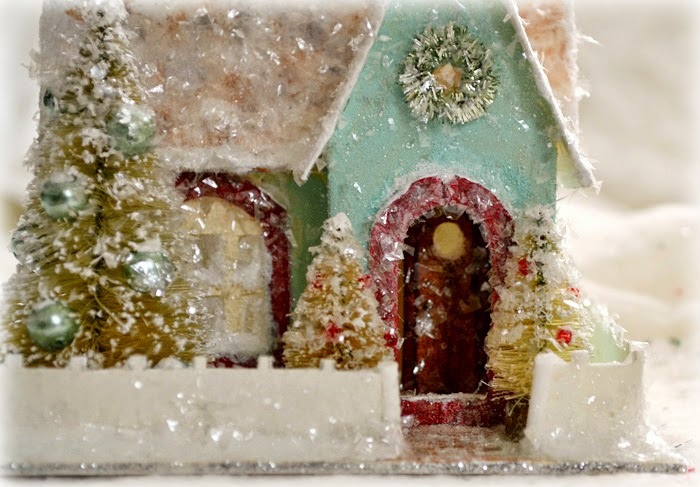 Your teacup and sweet glitter houses are beautiful - such pretty inspiring photos! I wish you the absolutely BEST the season has to offer. God be with you and your family, and prayers for good health and peace for you. 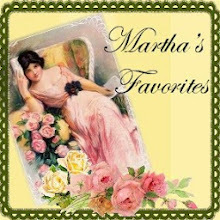 SURE is nice to know you are ok.
And yes, Martha has done a great job, such a good lady, too! Terri, I was so happy to see your comment on my blog today. We have all missed you so much. I love your little house.... and You know I love Royal Albert so how could I not love that thistle tea cup. Again, so happy to see you back. 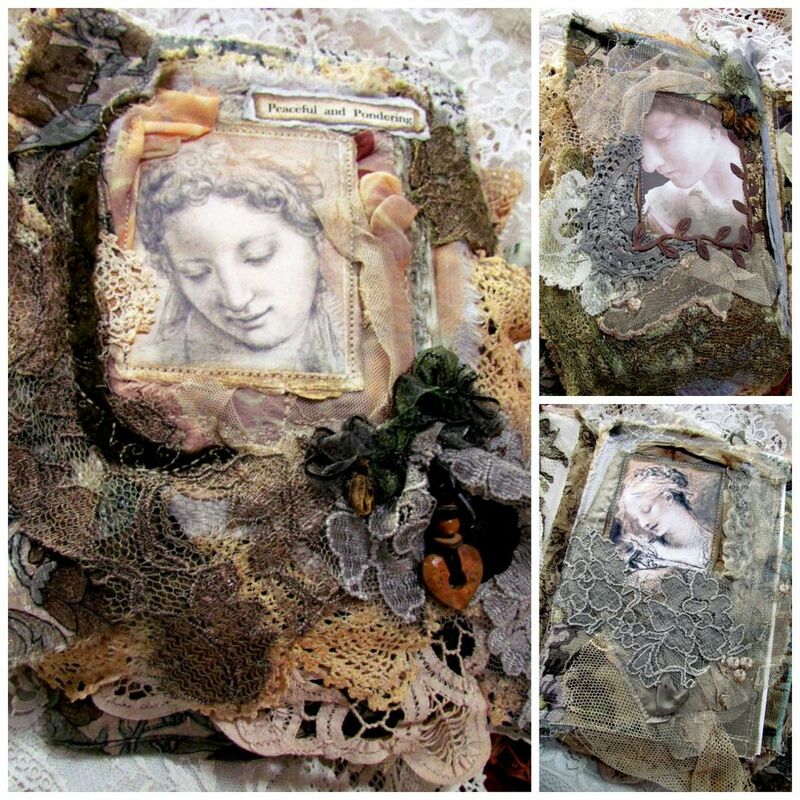 Hi Terri, so glad you are back sharing your lovely crafts and sharing tea time with us. Glad you are feeling better! 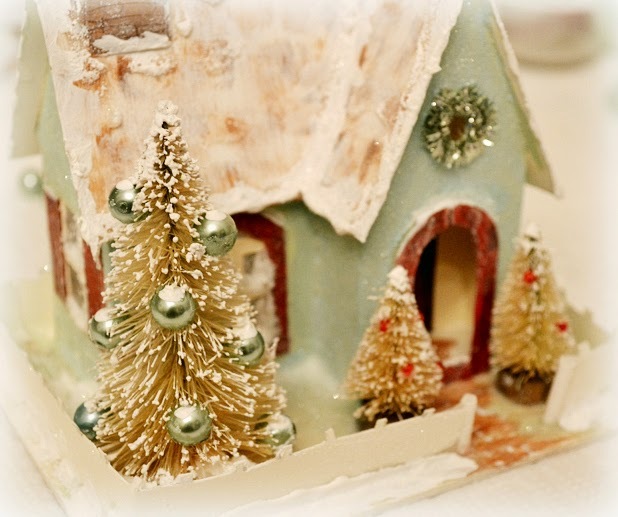 I love your Christmas house, you are so talented! It is so beautiful! Love your teacup, too! Hi Terri, Your glitter house is adorable! Love your teacup too. Glad you are back. Be happy, be healthy, and God bless! Thanks so much for your visit Terri, it was so sweet to hear from you again. What a lovely Tea cup and cozy little holiday house you made with your husband!! 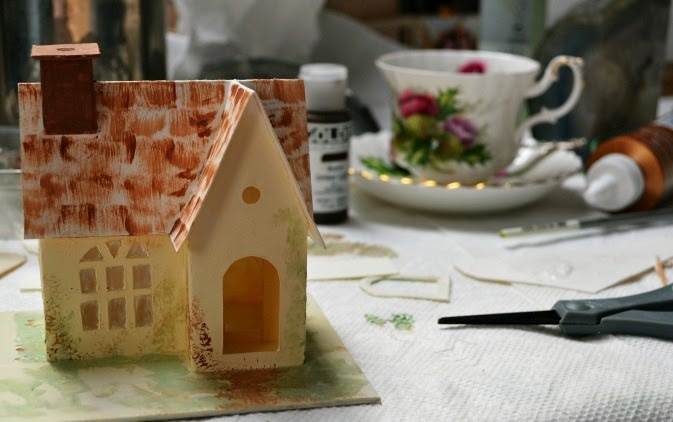 What a warm, cozy little cottage you've created! Don't you wish you could miniaturize that pretty teacup to fit inside? Hello Terri. Welcome back. We have missed you very much sweet friend. What a gorgeous little house. I do not anything tea related to post today. I just wanted to say hello and to wish you a wonderful holiday season. The tiny house is adorable, Terri. I love all your little touches and addition of sparkle here and there. 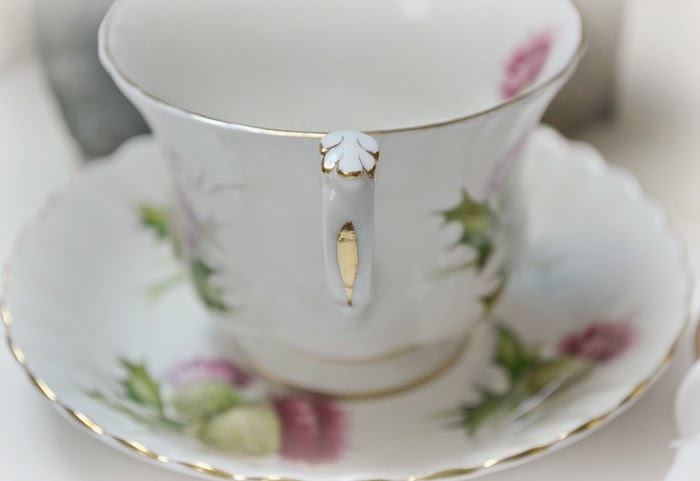 Your thistle teacup is enchanting! That is a perfectly precious little house you made. You have a wonderful talent and such creativity. Welcome back, dear Terri. Hope all is well. Just adore your little house. What a lovely surprise to see you back here where we have all missed you for so long! I am thrilled that you have been creating, cutting painting, glittering, stamping whilst working on your superb glitter house. Maybe we could meet in there for a cuppa one of these stary nights? Your Royal Albert Thistle cup and saucer and just perfect for this time of year. I have just created a 39th Wedding anniversary card with a thistle on it. Did you get my message sweetie via skype? Sending many snuggly hugs for a lovely Festive week. Hi Terri - So delighted to see you back among us and posting such a lovely little home made with your dear hubby. Just delightful! 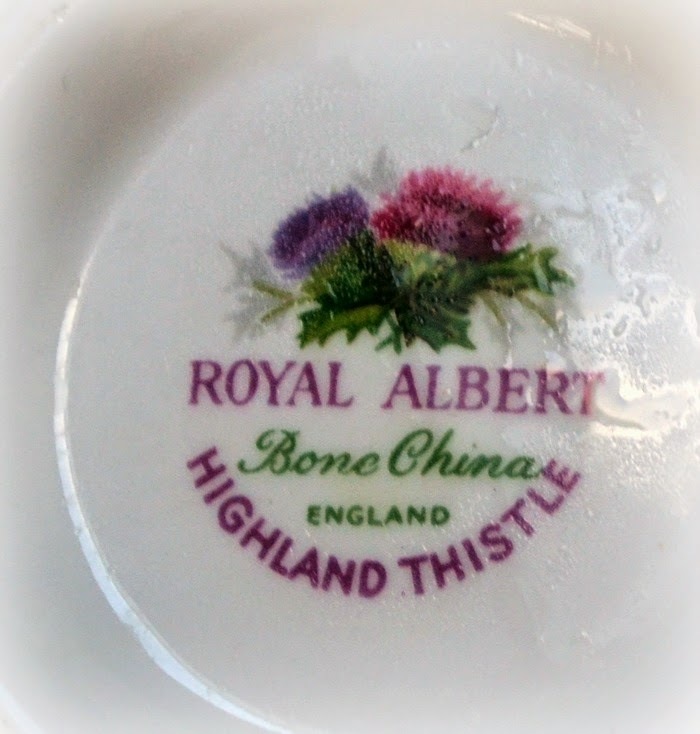 Your thistle teacup is beautiful - Scotland the Brave!! 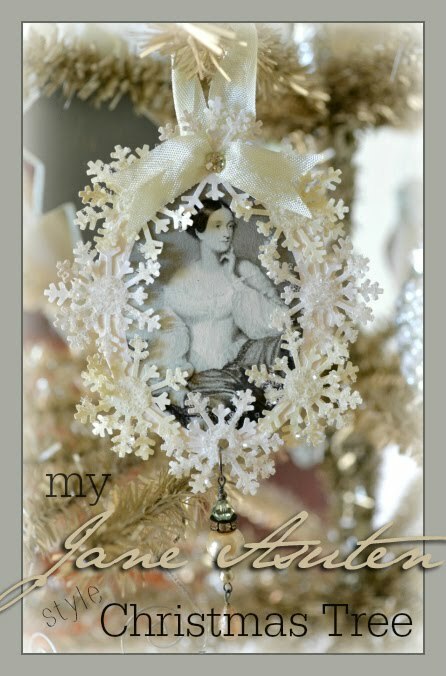 I have been away from teatime, too, with many new and exciting things happening, but I'll be posting Christmas week. 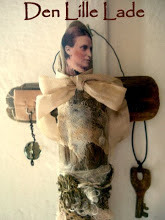 Martha has the linky open. I am sorry that you've been dealing with some difficulties and pray the Lord has smoothed the path in whatever you are walking in this season. Be ye blessed - you are always such a blessing! This little house is the most gorgeous thing I have ever seen! And your cup is divine! 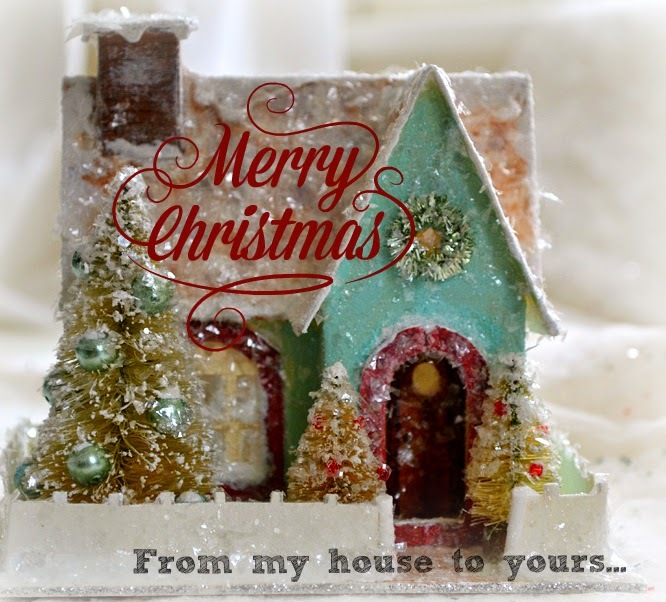 Merry Christmas to you and your family sweet friend! Big hugs! So happy to see a post from you. Your little charmer is darling! 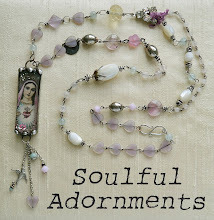 Angels to you Terri, and heartfelt good wishes for the coming year.